The program involves learning about science, history and art, said Jane Laraman-Brockhurst, coordinator for the project. The program will be run by Main St. Murals and will also involve volunteers and teachers from the National Parks Service and the Bureau of Land Management. Laraman-Brockhurst said this year’s program will involve field trips to learn about the desert’s flora and fauna, as well as a desert cleanup and land stewardship program. Laraman-Brockhurst said the first half of the project will consist of learning about the Mojave Desert’s plants and animals, including monitoring the population of an endangered fish and learning about desert tortoises. The second half of the project will allow students to express what they learned through painting and sculpting. 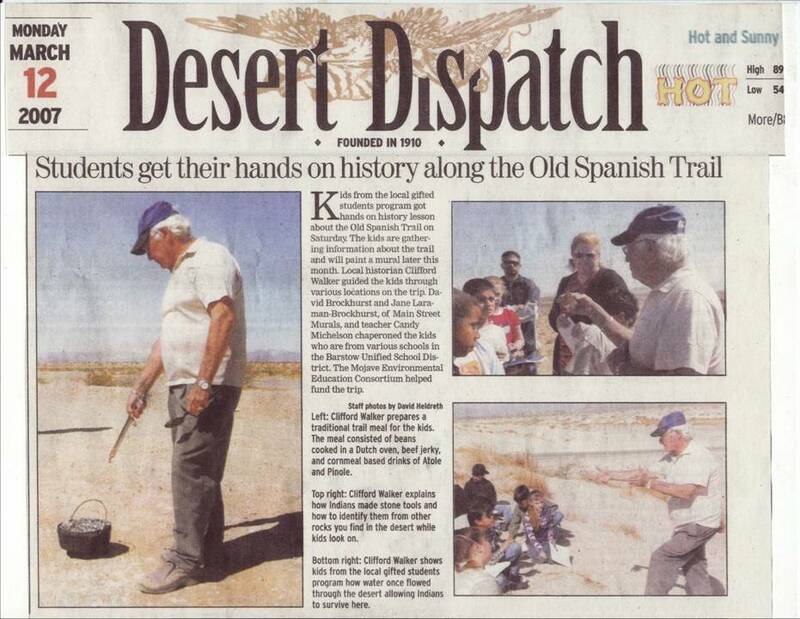 Children signed up for the project will be able to participate in several field trips to the desert, as well as a planned cleanup of El Mirage Off-Highway Vehicle area in May, said Laraman-Brockhurst. Main St. Murals has been helping run the youth program at the Desert Discovery Center for five years now and expect to have about 25 students in their program this year. To apply for the program or for more information, please contact Jane Laraman-Brockhurst at (760) 257-1052 or visit http://www.mainstreetmurals.com. 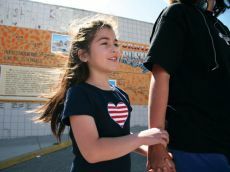 India Smith, 8, walks along Main Street on Saturday with her sister, Penny, 15, during a tour of downtown murals that depict Barstow history. Penny worked on the newest mural at the corner of Barstow Road and Main Street. 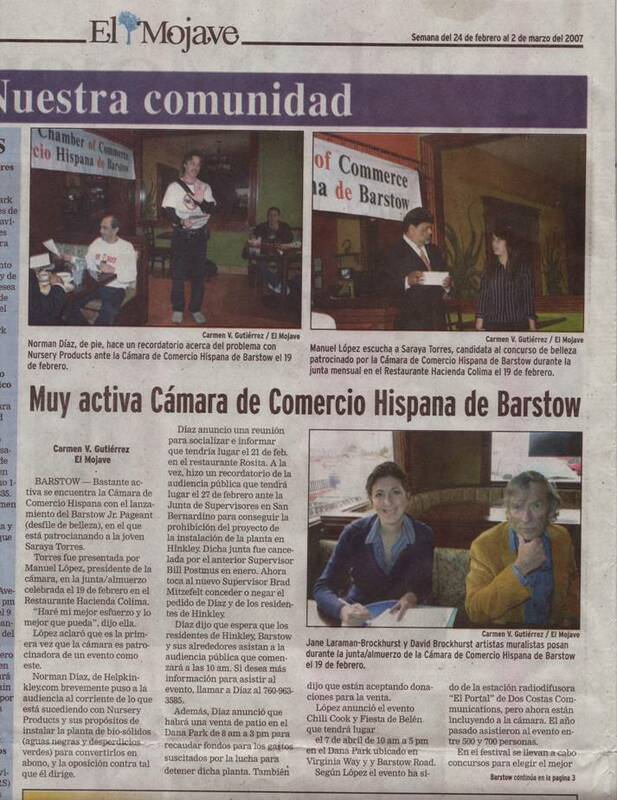 BARSTOW — Jane Laraman-Brockhurst hopes that a fusion of art and history will help to revitalize downtown Barstow. Laraman-Brockhurst is the president of the non-profit Main Street Murals organization, which dedicated its ninth mural project in Barstow on Saturday. The dedication of the mural, which is the second in Main Street Murals’ “Native American Voices from the Mojave Desert” series, also marked the kick-off of a new monthly walking tour of downtown Barstow. The tour covers highlights of Barstow’s history, as told through the murals along Main Street. “The mural program is education, redevelopment, community pride, all of those things,” Laraman-Brockhurst said. She envisions the free monthly tours drawing Barstow residents and tourists alike, and encouraging business owners to open up shops in the downtown Main Street strip. Along with the “24-hour art gallery” of murals along Main Street, Laraman-Brockhurst pictures businesses like a coffee shop and a bookstore, where friends can meet up and spend an afternoon wandering in and out of stores downtown. At some point, she said the monthly walking tours may morph into a horse-drawn carriage tour, which would add some historical color and allow people who are unable to walk long distances to participate. Local history buff Steve Smith, president of the Mojave River Valley Museum, led a group of about 20 local people on a tour of Barstow’s history Saturday, as told through murals lining Main Street between First and Seventh Street. The history lesson begins with the newest mural, depicting Native tribes of the Mojave as they hunt, gather desert plants and make food and other basic necessities. It runs through early explorers, gold miners, and trail blazers, and ends up with the more recent history of Route 66 and famous Barstow sites like the Harvey House. “History is kind of a hobby that has taken over my life a little bit,” Smith said. Yiyoung Chloe Hong, 17, will carry a piece of Barstow history with her back to Korea. The exchange student, who just finished up her sophomore year at Barstow High School and heads back to Korea at the end of June, helped paint the newest mural. She was one of several students in the high school Art Club who spent about three months working on the piece. “I learned a lot about Native Americans, because before we painted, we researched a lot,” she said. “It was a chance to learn about the area.” Fellow Art Club members Jiazi “Kitty” Guo, 17, and Penny Smith, 15, said they learned a lot in the process as well. The students started off by doing research in the library. While the mural was in progress, they spent several hours every Wednesdays and Sunday painting the panels at Laraman-Brockhurst’s house in Newberry Springs under the direction of muralist David Brockhurst, Barstow High School art teacher Sabrina Gilmore said. The completed panels were erected on the side of the Odyssey building on the southwest corner of Barstow Road and Main Street. The next major educational art project Main Street Murals has planned will focus on the Ice Age, Laraman-Brockhurst said, but in the meantime, the group is planning several smaller projects to be completed in the fall, including murals depicting Barstow’s old Beacon Tavern and the 20-mule teams used by mining companies to haul borax from Death Valley in the late 1800s. 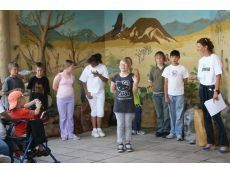 Kristina Webster, 11, (front center) explains her favorite parts about the six-month educational and art program through Main Street Murals that culminated with the unveiling of a new art installation at the Desert Discovery Center. BARSTOW — Most adults would not be able to say what an atlatl is, but 12-year-old Richard Sappington knows. 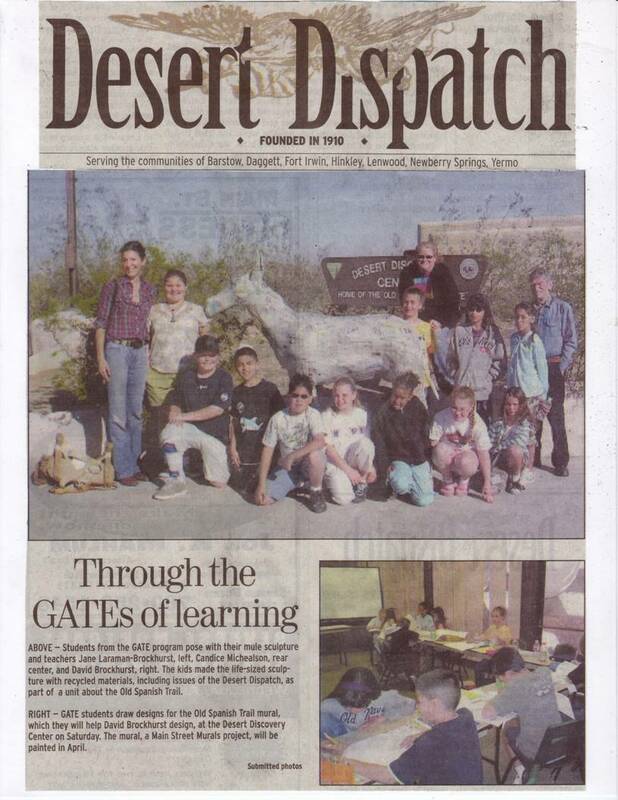 Sappington was one of about 20 Barstow-area students who participated in “Native American Voices from the Mojave Desert,” the most recent education and art program put on by Main Street Murals. During the course of the six months of field trips, workshops and art, he learned that before Native Americans began using the bow and arrow, they used a device called the atlatl to fling spears and darts. “My favorite thing I learned that I didn’t know before is that there wasn’t just bows and arrows for Indians,” he said. 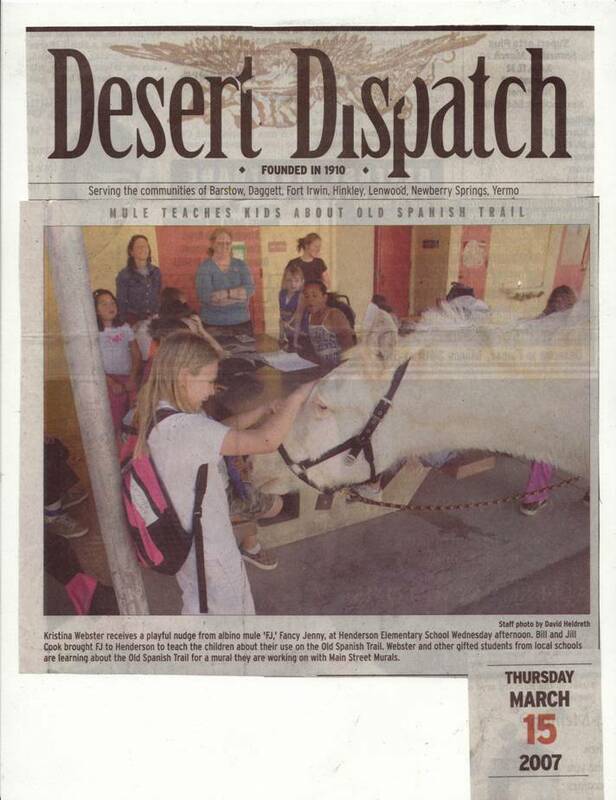 Sappington and his classmates publicly unveiled the results of their work at the Desert Discovery Center on Saturday. With some professional assistance, the students painted a mural that shows Native American people collecting and using desert plants in a Mojave Desert landscape. Jutting out from the mural, a planter holds live desert plant species like the prickly pear and barrel cactus. In front of the planter, the students set “rocks” made of paper mache, painted with replicas of petroglyphs, images carved into rock. A group of bird singers from the Cahuilla tribe performed a ceremonial dance with rattles made from gourds at the mural’s dedication. Harold Williams, a tribal elder of the Kawaiisu tribe from the Tehachapi area, came to give the art installation his blessing. In the process of making the mural, Main Street Murals president Jane Laraman-Brockhurst said, the students talked to tribal elders, archeologists and historians, writers, artists and botanists. They took trips to the Zzyzx Desert Studies Center and to Newberry Cave, where archeologists have found tools, jewelry and other remnants of early man. They practiced throwing an atlatl and grinding corn with a mortar and pestal to make corn and mesquite patties that they cooked over a campfire. The students said, “Yuck,” when Laraman-Brockhurst mentioned the mesquite juice they sampled, but they gave the learning program a thumbs-up. “I’m going to definitely come back,” Sappington said. Eleven-year-old Kristina Webster said that aside from meeting new friends, Newberry Cave was her favorite part of the class. Alisa Parks, 11, gave the Newberry Cave a high recommendation, too, but said her favorite part of the class was learning about how the Native tribes used the desert plants and animals. Muralist David Brockhurst, who guided the students through the process of making the art installation, was as fascinated as the students by what he learned in the six-month program. Brockhurst laid down the groundwork for the mural and made some of the three-dimensional elements, but other than that, the students had free reign. Giving the kids some creative freedom makes the final product more interesting, he said. Next up for Main Street Murals is a project focusing on the Ice Age, Brockhurst said. To find out more or enroll a student in the program, call Jane Laraman-Brockhurst at 760-257-1052. To see the “Native American Voices from the Mojave Desert” art installation, visit the Desert Discovery Center at 831 Barstow Road. The mural is located on the back patio. Inside the discovery center, an exhibition shows photographs and stories of what the students learned in the process of making the art piece. 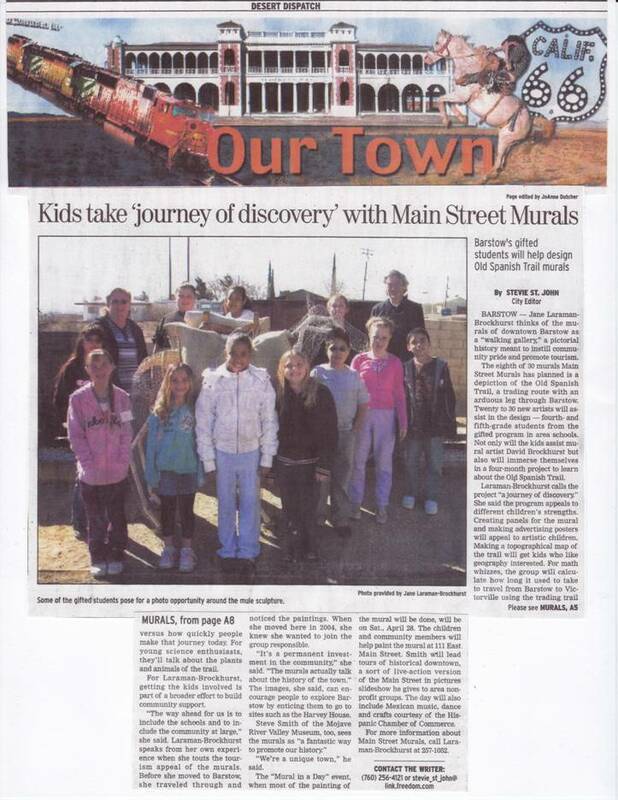 Another Native American-themed mural by Main Street Murals, on Main Street and Barstow Road, will be dedicated May 31. The dedication will also kick off Main Street Murals’ free walking tours to be held at 9 a.m. the last Saturday of each month except for August. For more informationcall Jane Laraman-Brockhurst at 760-257-1052.